By most common hardware metrics, the Nexus 7 tablet is a pretty impressive piece of kit. It feels decent in the hand, the screen is bright and sharp and the internals appear to keep up with just about anything you throw at it. It will inevitably be compared to the Nook, the Kindle Fire and every other Android tablet on the market, and it should stack up pretty well to most of those. Some will also compare it to the iPad, but those people are being silly. The importance of the Nexus 7 lies not with its features, but with its ability to deliver Google’s tablet ecosystem the series of pulmonary shocks it needs to finally get into the proper rhythm. I’ve had a bit to play with the Nexus 7 now and it’s clear that, while it is good for an Android tablet as far as hardware, very little has been done to Jelly Bean to make it great for tablets. It’s basically the phone version of the OS stretched out to fit the larger screen. The home screen, app launcher or any of the other bits of the standard interface are stuck permanently in portrait, with only apps available in landscape. It’s the behavior of an OS designed for a phone, not a widescreen tablet. As far as all of the fun ‘tablet-esque’ tiling you see in the videos and still shots, those are essentially (removable) widgets designed to front either your content or content that Google wants you to think about purchasing. For those hoping for a mature tablet OS from Google, this is a bit of a disappointment. Although the performance enhancements of Jelly Bean are immediately evident and most welcome, there is little here to recommend it as an OS that works better on tablets of any size, especially if it comes to screens 10″ or larger. That being said, the hardware feels good. It’s slightly too heavy and slightly too thick, but solid, with a pleasant back texture and nicely beveled edges. The speaker, while loud, is placed directly behind your left hand when you’re watching a movie, which seems a bit silly, but well clear in portrait modes. There is a minimum of ports and external decorations, although there are one too many logos. But that widgetized home screen does have a tale to tell. 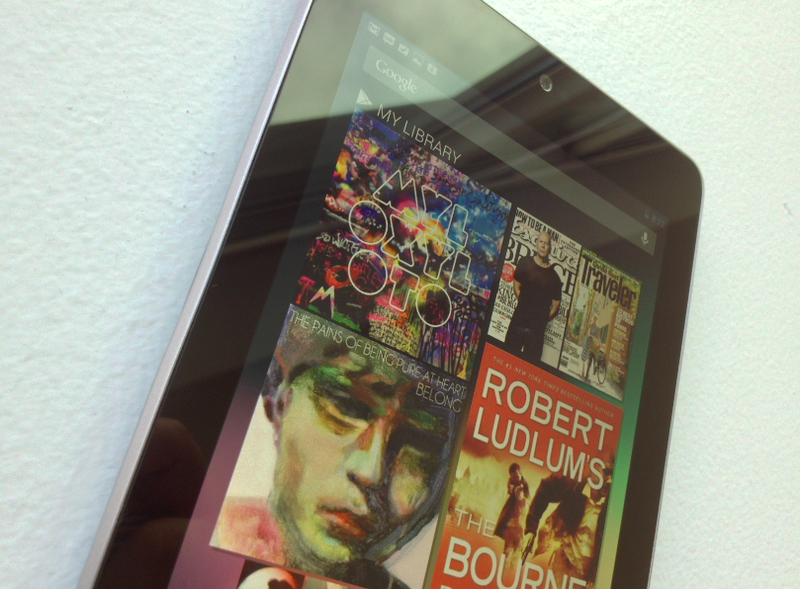 The Nexus 7 is about consuming content, not providing you with the best overall tablet experience. It is there to help you suddenly realize that you might enjoy purchasing things, like the newly announced movies, from Google Play. 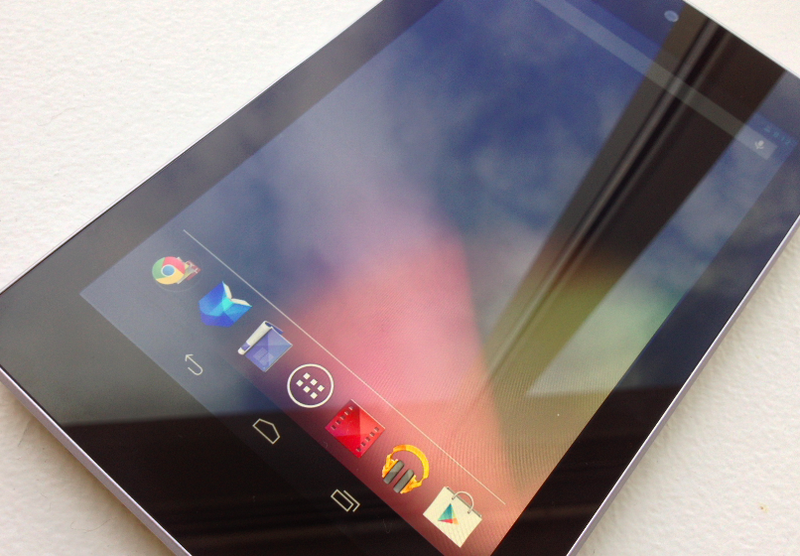 Those widgets comprise the vanguard of Google’s new tablet strategy. Entice users to purchase and consume content on a device that bears all of its ad-supported services. The Kindle Fire was rushed out so that Amazon could shove its crowbar into the holiday buying window, but it wasn’t done for the hardware profits. 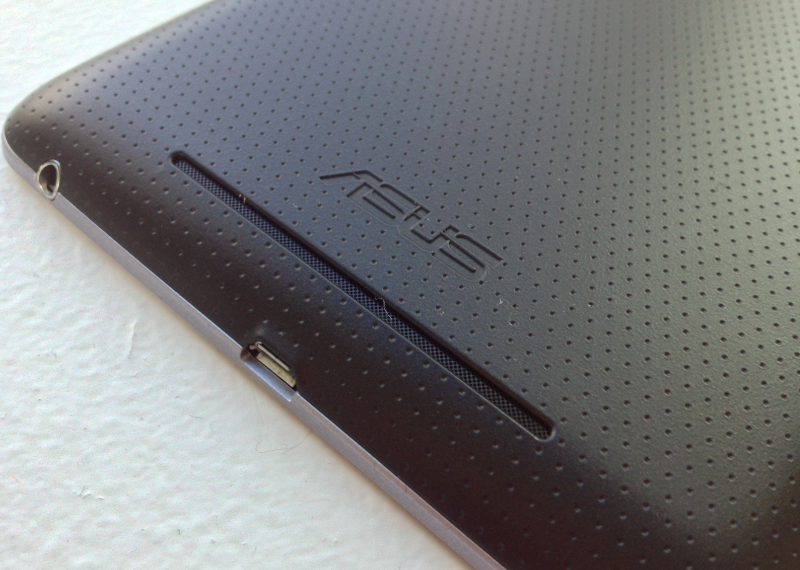 The same appears to be true for the Nexus 7. In his excellent ‘mini-review’ Brian Klug of Anandtech expresses shock at the Nexus tablet’s price, especially when compared to competing Android hardware that is selling for hundreds of dollars more. The truth of it is simple, Google is selling the Nexus 7 at or near cost through the Google Play store in order to get those content widgets into the hands of customers as quickly as possible. It would not surprise me at all if ‘sold through’ not only meant that it was being sold at hardware cost, but that here may even be an overall deficit that pushes it into a ‘loss leader’. That term refers to what brick and mortar retailers do when business is in need of a boost. They price one attractive item extremely low, normally very close to cost, just to get people in the door. The hope is that, while they’re in there, they might buy accessories or other items that will make it worth your while essentially losing money on operating costs during the sale. This is Google’s strategy with the Nexus 7, get them in the door, then hope that they’ll pick up some movies, books and more while they’re here. But, more importantly, that they’ll use all of the ad-supported Google services that come pre-installed on the device. The price should also make it attractive for developers looking to make apps for Android tablets. The developers I spoke to yesterday appear to be excited about the prospect and think that it should help to onboard those for whom a $500 tablet was too expensive to just ‘play around’. And that kind of serendipitous hacking around is exactly what Google needs for the apps available on its tablets to gain some semblance of parity with iOS. That’s the reason why I believe that the Nexus 7’s lack of a cellular connection is a boon, not a bust. It keeps the carriers out of the equation entirely, providing a platform that Google will always be able to offer the latest build of its OS on for developers and early adopters. It’s a ‘first run’ reference experience, even more so than the Galaxy Nexus or other phone devices, which still must undergo carrier testing before getting seeded with updates. 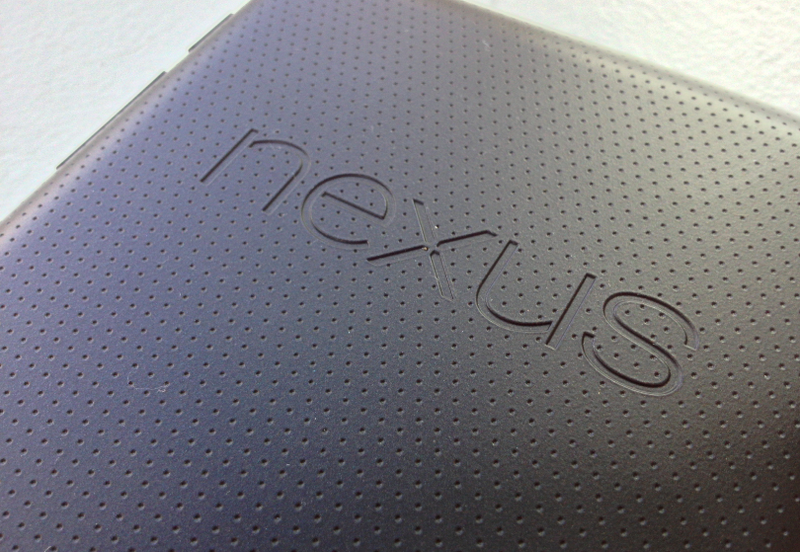 Now, all of these hopes for the Nexus 7 are ones held by Google. There are still a lot of doubts about it for me. The Jelly Bean experience is very good and very smooth on the Nexus 7, but I experienced a lot of silly little issues using it to do normal things like watching a movie, taking a picture with the non-existent camera app, even downloading and installing apps. But, as this isn’t a final release version of the OS, its hard to give it a ton of grief now without the obvious defense being thrown up. Still, there seems to be quite a bit that needs to get worked out before the ‘mid-July’ ship date and I think that Google missed an opportunity here to make Jelly Bean a ground-up great experience as a tablet OS, rather than just generally very good. Still, it’s the absolute best experience I’ve had on an Android tablet. Which is either saying something about the quality of the Nexus 7 and Jelly Bean, or something about the state of Android tablets until now. Hopefully it’s that the Nexus is good. Let’s go with that. If you needed proof that the Nexus is aimed at lowering the barrier of entry into Google’s ecosystem, the price should be enough, but there is another detail that I think is just as telling. When you purchase a Nexus 7 from Google Play, you will have the option to check a box that pre-loads your Google account, including all of your apps and data, onto the device. This way it arrives at your door in need of just a password to begin using your personalized tablet. If this sounds familiar, it’s because this is exactly what Amazon does with its Kindle devices. Google told me that the option was for the Nexus 7 only for now, but that it would roll out to other devices in the future. Note the inclusion of the check box, that’s a nice detail and provides you with a choice that you aren’t offered by Amazon, who ships your device set up for you regardless of the dangers of delivery issues or theft. If you purchase, say, 10 devices for the office, Google removes the option, as it becomes impossible to determine who will end up with what device. It’s a small detail, to be sure, and one pioneered by Amazon. But it speaks to Google’s efforts to make the entire experience of getting your window onto its content up and running as smoothly as possible. The Android tablet market thus far has been flat out abysmal. Low sales, poor performance on behalf of the software and sad content options have prevented it from gaining any real traction in the face of the iPad’s chokehold. Google is hoping that the Nexus 7 will finally jolt the heart of its tablet ecosystem into some semblance of healthy life.